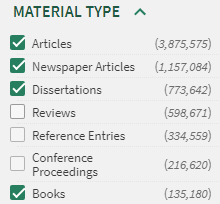 Over the course of this year, W&M Libraries tested out a new look (user interface or UI) for the library catalog. Our catalog vendor, ExLibris rolled out the new UI two years ago and has made many improvements based on user testing. We are now at the point where we are ready to launch the new UI over the winter break. If you haven't looked at the new interface yet, we invite you to try it out! Easily identify or filter search results for open access and peer-reviewed resources. Need the most up-to-date articles for your research? The New Records filter will show you the most recent content from the past week or month. 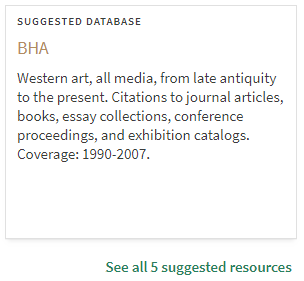 Our statistics show high numbers of keyword searches for databases, so the catalog now provides suggested resource links that go directly to the desired database. Journal searches now provide the option to view the journal in BrowZine, a user-friendly website for reading many of the journals to which W&M Libraries subscribes. Articles searches also have links to view the contents of the issue the article appears in through BrowZine. We came up with our own system of icons to make it easier to scan the search results and quickly identify what’s an article versus other text resources. You can select multiple filters at one time and expand the filters more easily. 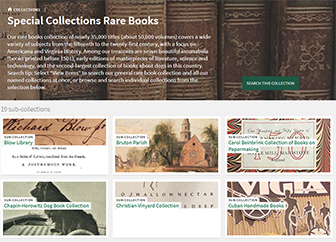 A new visual interface allows you to search Swem’s Special Collections Resource Center rare book collection. Sign-in to access your account and renew your checked out materials with one click. Why change how the catalog search looks? In addition to changing the appearance of the catalog, updating to the new interface gives us access to behind-the-scenes improvements that our vendor, ExLibris, releases. Now that the new interface is two years old, ExLibris makes minimal updates to the current catalog interface we're using which means the bugs we report don't get fixed. This is frustrating for all of us! We will also be able to test and make updates to the search more quickly which will help us improve the discoverability of our resources. Changing the appearance of how we search is always challenging, but we hope that some of the new features we introduce will make the change easier. Will my search results change? Your search results will be the same. The new interface mainly makes identifying types of resources easier through visual cues. It also makes filtering results more efficient than before. When will this update happen? We plan on releasing the update the first week of January before classes start. When we update in January, the search on the homepage of our website will go directly to the new interface as will catalog.libraries.wm.edu. Will my current permalinks work after the switch? Will my saved searches and e-shelf be saved? Yes - saved searches and saved items in your e-shelf will be transferred to the new interface. The e-shelf will change slightly however. Instead of using folders, the e-shelf now uses labels. "Tagging" records with a label is the same as putting the record in a folder. The new e-shelf interface makes creating and adding labels to multiple records at once much easier, which will require less clicking and copying and pasting to organize items. How do I report an error or make a suggestion? If you see something that's not working, please let us know! There is a "Feedback" button on the side of every page in the new interface. You can use this to report errors and bugs, or provide general feedback and suggestions on the new look. The direct link to that form is https://wmsas.qualtrics.com/jfe/form/SV_7UPBTaYU07tVkln. You can also email us at primo@lists.wm.edu. Does the new interface take accessibility into consideration? Yes - ExLibris created the new interface to comply with section 508 and WCAG 2.0 AA standards. We have made additional improvements to color contrast to help improve text visibility.